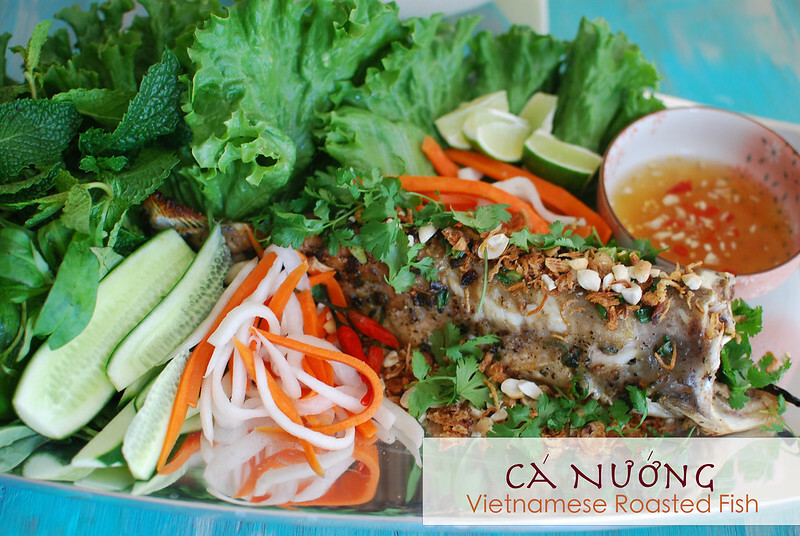 Cá Nướng is a really common Vietnamese dish of roasted fish. And although it’s most often made with catfish because of its firm and somewhat fatty flesh, you can use any fish that can hold up to high heat while still staying moist. When given the choice, I recommend roasting a whole fish. Not only does it help retain moisture but you’ll almost always get a better flavor when you cook your proteins bone-in. This is when it’s so nifty to have a trusted fishmonger — or in my case, an Asian grocery store, nearby. The latter almost always has live catfish on hand (so you’ll know it’s super fresh) and both options can do the dirty work for you –which I totally appreciate as I hate cleaning fish. And don’t be surprised to see your once silver/black catfish “turn” white when it comes back cleaned for you. Many fishmongers will scrub the catfish skin to remove the dark outer layer. Although it’s completely edible, the darker skin does make your fish taste a tad “fishier” so the extra scrub down is a good thing. I’ve adopted my eldest seester’s method of preparing Cá Nướng which is not only easy to do but is rather simple when seasoning the fish. A lot of folks will use a variety of aromatics and spices to marinate it. But since you’ll typically dunk the roasted fish into a nước chấm (dipping sauce), you can stick with a minimal preparation before cooking the fish as the sauce will provide the extra flavor punch. Cá Nướng can be served over rice, with vermicelli noodles, inside a bánh mì (sandwich) or how we typically like it —cuốn bánh tráng (wrapped in rice paper). The rolls are filled with tons of fresh herbs and veggies that when combined with the roasted fish, is absolutely amazing. They have tons of different textures, knock-out flavor and are deliciously light on the tummy. 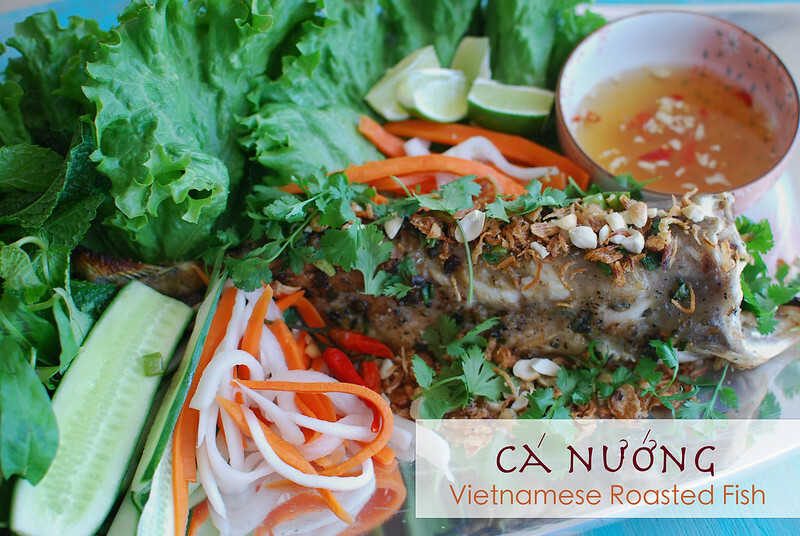 Serving your Cá Nướng as spring rolls is also a fantastic way to entertain family-style and would be a prefect al fresco dining option during the upcoming warm months. Your guests will love making their own rolls and adding their favorite items inside. And don’t let the ingredients list and recipe fool you. It may seem like a lot of different components but it’s not difficult at all. You can also prepare many of the components in advance to cut down on prep time. Prepare scallion oil (hành mơ): In a sauté pan, slowly heat the vegetable oil over low. Add the chopped scallions. Cook the scallions until they are wilted but still bright green–approximately 2-3 minutes. Pull from heat and allow the scallion oil to cool until room temperature. Rinse the fish with cool water and pat dry with paper towels. Coat the fish with the scallion oil and season the exterior and interior with the garlic powder, black pepper and kosher salt. Stuff the fish cavity with the scallion stalks and prop it upwards on a baking tray. Allow the fish to marinate for 20 minutes. 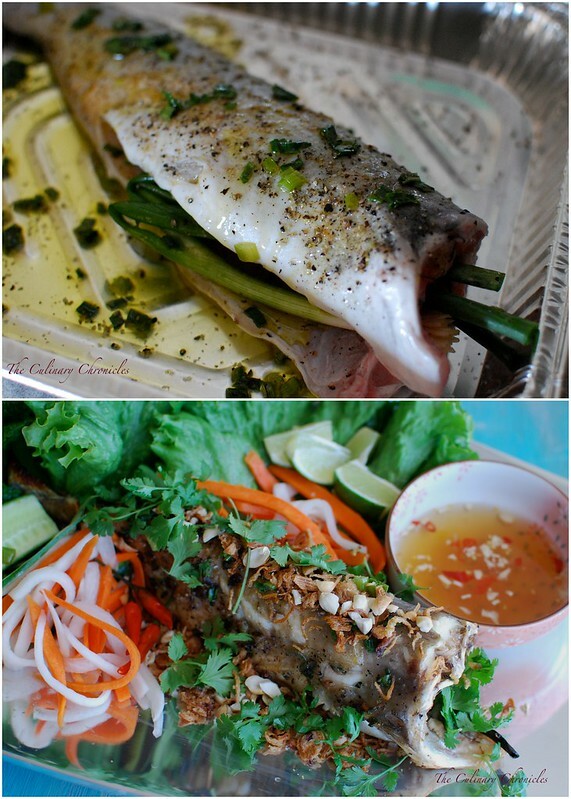 While the fish marinates, prepare the nước chấm. Whisk all the items together in a small bowl. Add chili paste to taste. Set aside. Roast the fish in an oven heated to 400 degrees F for approximately 25-30 minutes or until the flesh is opaque and cooked through. Turn on the broiler of your oven and broil the fish for about 60-90 seconds to slightly crisp & brown the skin. Remove the fish from the oven and transfer to a platter. Top the fish with the fried shallots, chopped peanuts and cilantro leaves. 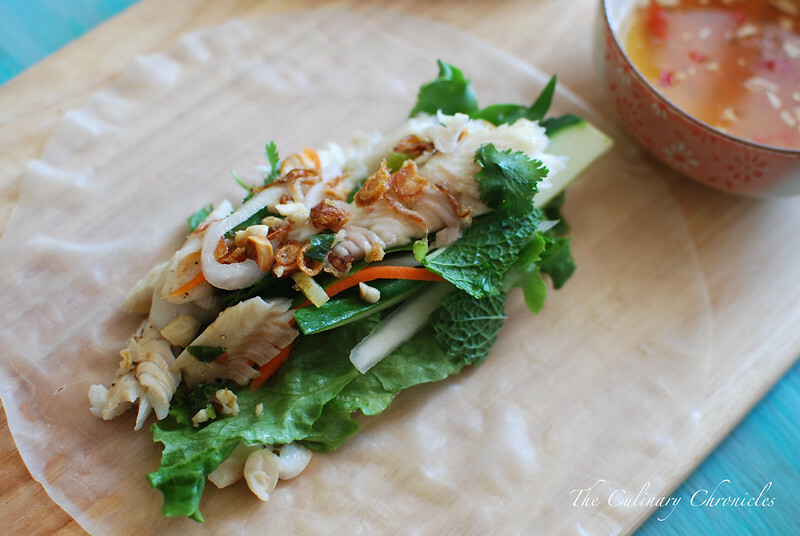 To serve the fish as a spring roll (bánh tráng cuốn), dip one rice paper sheet in warm water and place on a plate/flat surface. The rice paper will slowly become pliable. Lay one piece of lettuce in the middle of the sheet and top with some of the fresh herbs, đồ chua, cucumber slices and pieces of the fish. Spoon some of the peanuts and fried shallots on top. Tightly roll the bottom of the rice paper over the mound and then fold the sides in. 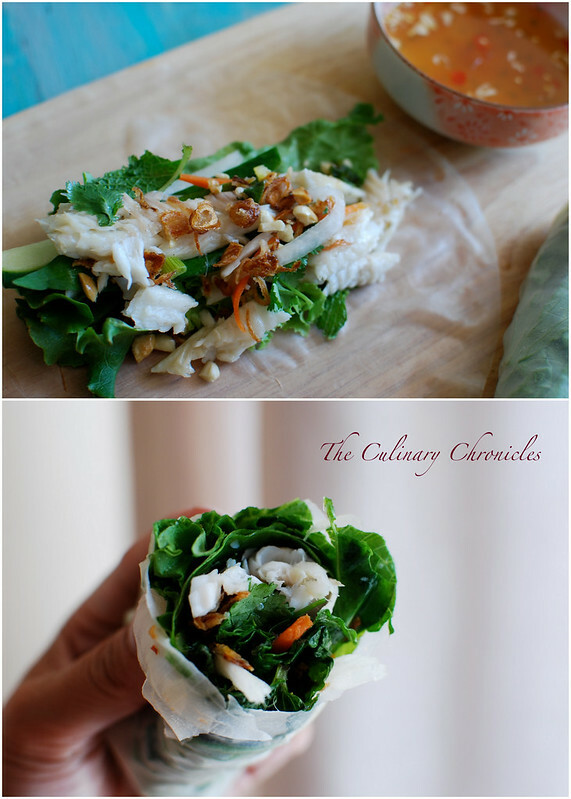 Continue rolling the rice paper up until you’ve created a secured roll. Serve the rolls and fish with the nước chấm. Ăn ngon! Absolutely amazing!super successful dinner,thanks a lot!